As soon as I walked into The Riot Room, Arsis took the stage. The technical and progressive style they have with their brand of death metal translates well on stage just as is does on my headphones. Arsis was a tight and heavy band throughout their whole set, however bassist Noah Martin stole the show for me as his energy and playing was just captivating. With such a diverse night of metal, they put on a great tech/prog death metal show! Next up was Septicflesh, who seemed to be having some technical issues before they even started. The show must go on though but the bass was noticeably lacking during their set. 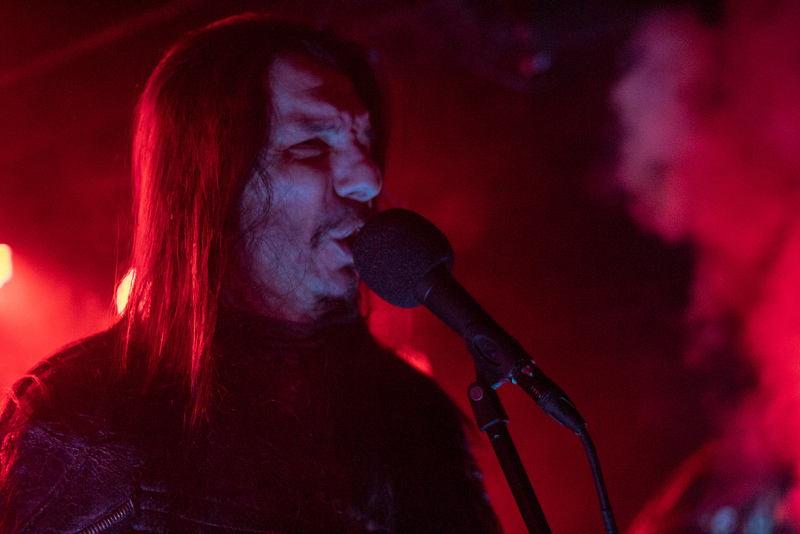 Even with this issue coming to light, Septicflesh put on one hell of a show. Their orchestral death metal ways is just brilliant on stage. Spiros’ bass may have had problems but his energy and vocal performance was still devastating. He still played his bass and rocked our socks off. Christos and Psychon devoured us with their guitars and headbanging and drummer Krimh just annihilated us with his performance behind the kit. Even though Septicflesh wasn’t the headlining band for the night, they still gave us all 110% and played their hearts out. The crowd enjoyed it and you can tell everyone was having a great time, even while smashing into each other. The crowd grew larger as more leather and war paint clad fans entered the pit and Ensiferum took to the stage. I have never seen them before and I was in for a treat! I have often enjoyed their epic folk metal ways in the past and now I was going to finally get to experience them in all of their glory live! As soon as the band started playing “For Those About To Fight For Metal”, the energy just skyrocketed on stage as well as the crowd. Two lads entered from the main entry/lobby area wearing helmets and some chain mail and got into the pit to rock out with the crowd. It just added to the overall feeling of the entire show. Petri was brilliant to watch on stage. Nailing his vocal and guitar duties. Markus was fun to watch, as he banged his head and just couldn’t seem to stop smiling. When his time came to sing, he belted out his part with perfection. Another wildly great performer and non-stop smiling chap was Sami, which was another great part of the show with his facial expression and antics. 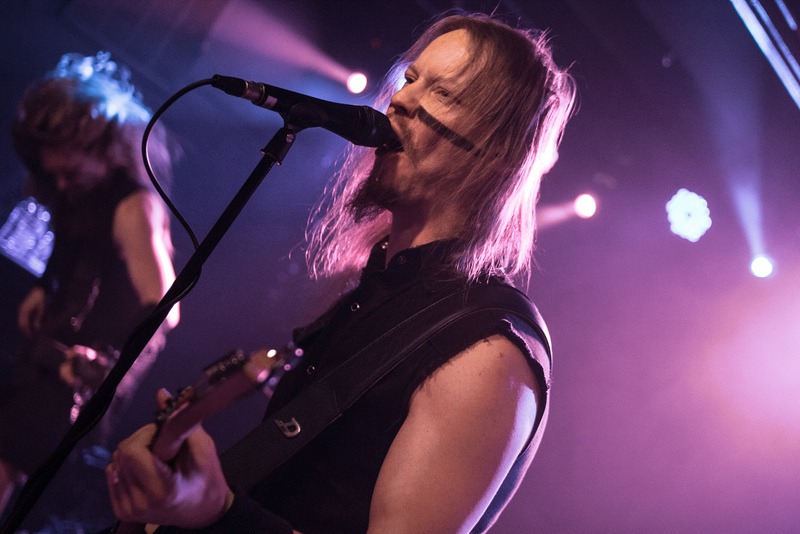 Janne’s rhythmic war parade was fantastic and together….Ensiferum was on fire. Their setlist was glorious, their sound was absolutely fantastic and the on stage energy was radiant! The entire night was perfect and Ensiferum’s set was amongst one of the coolest shows I have witnessed in a while. Simply put, they brought the metal and played it loud and proud for us all. 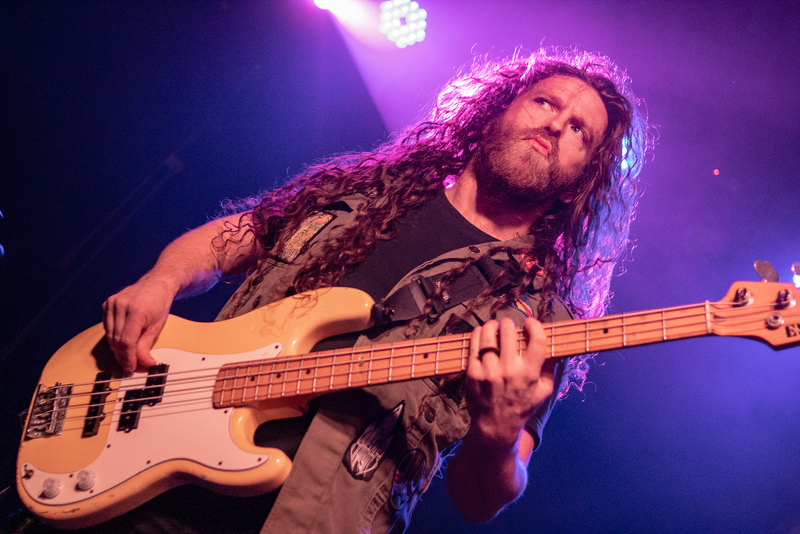 Enjoy the photo gallery from that show, courtesy of Ulfhednar Photography.